Jan. 5, 2015 - PRLog -- The West Virginia Auxiliary – Wives Behind the Badge, Inc. is proud to be behind one of the fastest growing initiatives for the organization to date. 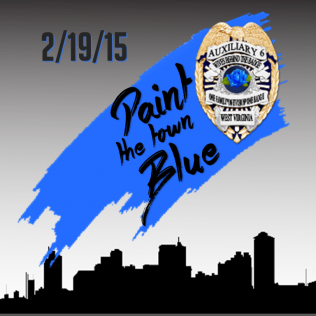 “Paint The Town Blue” will be held on Thursday, February 19, 2015 across the entire state of West Virginia. The Auxiliary has received support from businesses and residents who have agreed to display blue ribbons in windows and on doors throughout towns and cities, big and small. Jan Miller, Director of the Auxiliary shares that “this idea was born very simply and I’m humbled by the eruption of support that we have seen in just two weeks.” To date, the organizing group has over 3,600 participants. Individuals or businesses who wish to participate are encouraged to email the Auxiliary or phone 304-504-5063 to arrange for delivery or pick-up of ribbons. Direct shipping is available for only $8 and provides the participant with an assembled ribbon; pick-up at various public sites is available for only $5. “Paint The Town Blue” is being held in conjunction with the parent organization’s event “Step Out in Blue”, which encourages supporters of law enforcement to simply wear blue on the third Thursday of each month. The event page can be found on Facebook under the event name. In addition to this, the Auxiliary is once again offering its tee-shirt campaign available through Booster, which can be found via the Auxiliary Facebook page. The West Virginia Auxiliary – Wives Behind the Badge, Inc. is a registered not-for-profit in the state of West Virginia and was established to support law enforcement officers and their families. All monies raised in and for the state remain there to assist in times of need and through the parent organization’s programs. Donations can be made through PayPal or by visiting Wives Behind the Badge, Inc. online.